Happy St. Nikolaus Day! According to the German tradition, children (and perhaps some adults) put out their Nikolaus-Stiefel, or Nikolaus boot, last night. 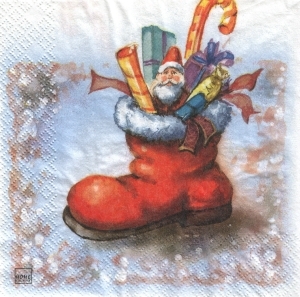 Those who were good woke up this morning to a shoe full of treats provided by Nikolaus himself. Hope everyone is continuing to enjoy the holiday season. Categories: Holidays | Tags: German holidays, German traditions, Saint Nikolaus, St. Nikolaus boot, St. Nikolaus Day | Permalink.